We are excited to present a fantastic new product in the RetinaLyze portfolio. We have been working on it for quite some time, and are looking forward to the new possibilities the product creates. The product enables a third-party to make a built-in feature in an already existing system such as a Patient Administration System, Optician Software or other software, where the service could be added. The new product is called RetinaLyze API, but has the flexibility to be white labeled to any vendor and enables the vendor to customize their own software entirely. The product delivers a simple analysis to the end-user without other information than the result. The vendor can customize the look and feel of their own software and embed the screening functionality and result from the RetinaLyze API. The RetinaLyze API is basically a standardized way for other programs or devices to communicate directly with the RetinaLyze algorithm. 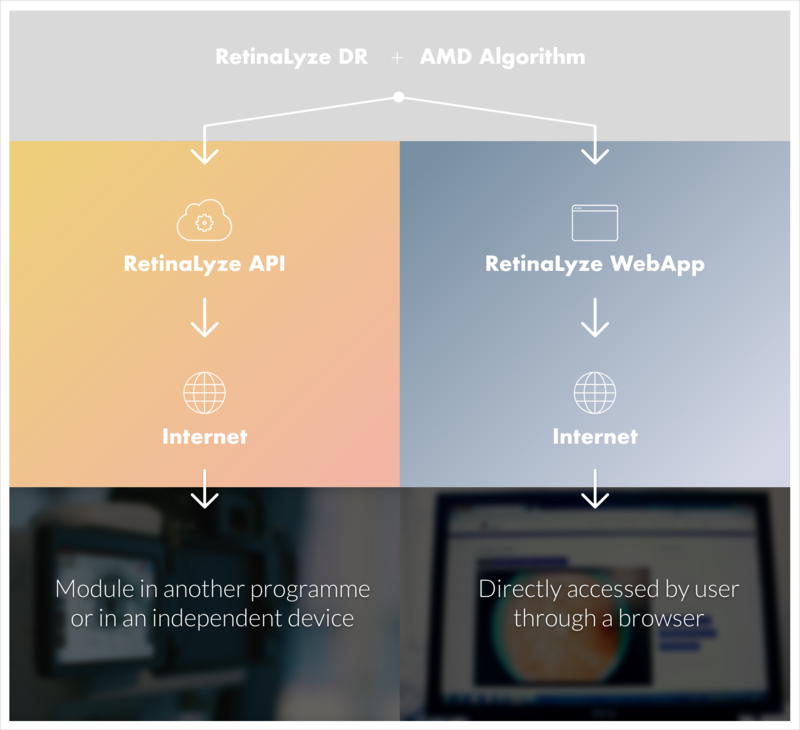 The RetinaLyze API makes it possible for a third-party to create eye-screening software or add automated screening of retinal images as added functionality in their existing/new software or device. So how does this differ from the RetinaLyze Web application? While utilizing the same algorithm, the RetinaLyze API is not directly accessible through a browser and cannot function on its own. It needs a third-party software to send it pictures for analysis and to receive and show the results. The communication (sending of images and receiving results) happens over the internet (and not on local hardware such as a PC or device). Since the RetinaLyze API utilizes the same algorithm as the RetinaLyze Web application, the documentation and certifications already in existence can also be used for this service. Please do remember that the target group does not exclude larger hospitals and chains of clinics aiming to add this functionality in their existing self-developed software. What are the main benefits of using the RetinaLyze API? RetinaLyze can also be used as an image and result database for your fundus images, if you do not wish to store them on your servers (optional feature).